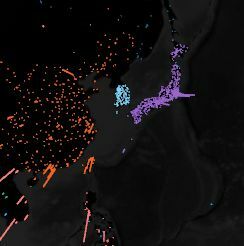 When I posted Google's beautiful globe visualization of languages used to search the web around the world, it didn't occur to me to note that, like the iconic photograph from space of the Korean peninsula at night, the Google WebGL globe vividly illustrates Korea's division as a digital divide. Click on the accompanying graphic to see a full size version or go directly to Google's globe animation here and rotate it to hover over the Korean peninsula. 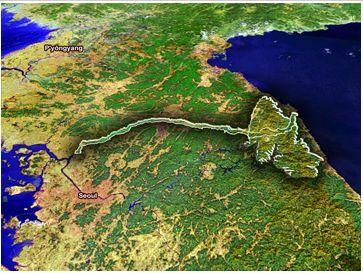 Readers of this blog will know that I've been interested in the status of the DMZ as a digital divide and the related question of the role of new digital media and communication generally in eventual Korean reunification. The AP carried a story on the issue which was published today by USA Today, entitled "North Korea cracks down on knowledge smugglers." All of this relates directly to the 2018 Winter Olympics to be hosted by Pyeongchang, a beautiful alpine city in Gangwon Province, the only province of South Korea that is divided by the demilitarized zone (DMZ). The media attention that will predictably focus on Korea and Pyeongchang before and during the 2018 Winter Games will draw attention, as never before, to the political and human tragedy of Korea's continued division, for at least two reasons. One is the new role of digital and social media in the Olympics, about which I've only begun to speculate, as in this 2011 post. Another, more important reason is that the 2018 Olympics will inevitably focus attention upon a reality that the mainstream news media and the whole world have chosen to address only sporadically and prefer to avoid, that the division of Korea is the last outstanding vestige of the Cold War in the world, a major obstacle to development of the entire Northeast Asian region, and a continuing human tragedy of untold proportions in the form of divided families. This focus of attention is sure to occur, simply by virtue of the way that modern media and digital networks work. One side effect of all this attention may well be to call more attention to the international proposal by the DMZ Forum to create a peace park in the DMZ (click on the graphic to see a larger version). See my earlier post on the proposal.